I've had my eye on Mexique ever since Chicago Magazine named it to the Best New Restaurant 2009 list. Since moving within walking distance there's been even less of a reason not get there and try the food. A description of "modern Mexican cuisine with a French influence" might scare people into wrongly thinking this is fusion gone wild. It's not. Executive Chef Carlos Gaytan does a very nice job of presenting classic Mexican dishes using modern French technique without pretension in an inviting causal atmosphere. The environment is a typical West Town unassuming storefront with a narrow and long dining area with a kitchen in the rear corner. As for the food, if we had been more ambitious I would have liked to try the six course tasting menu but instead we settled for two starters and two entrees. Even that was a difficult decision because there were plenty of items that looked appealing (more entrees than starters but plenty of both). We chose the daily ceviche special (shrimp) and cochinita rillettes (Achiote/Tequila Braised Pork Shoulder Rillettes, Crostini, Purple Pearl Pickle Onion, Rustic Celery Salad and Mango-Habanero Couli). 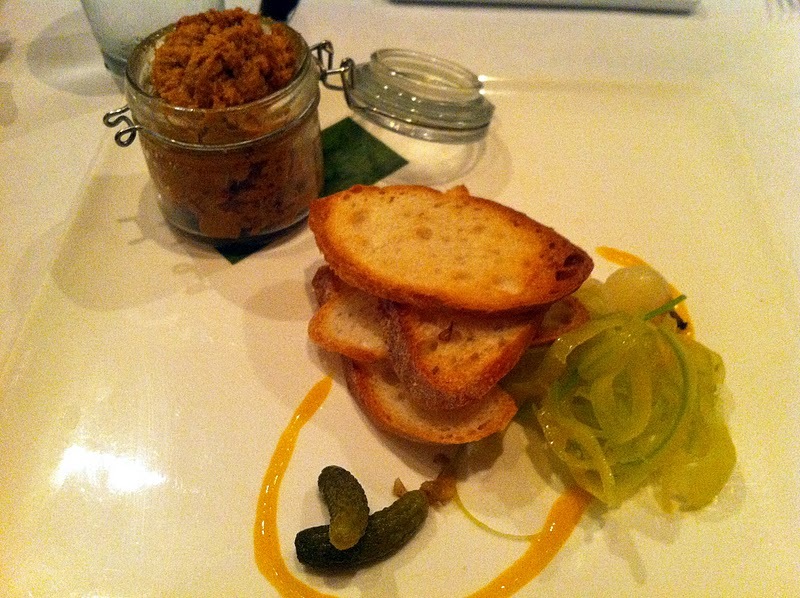 It's a really cool dish with the pork served in a small glass jar with the crostini, onion and Habanero on the side. The presentation is definitely French but the flavors are all Mexican. A fun and delicious dish, especially when the spicy Habanero is applied liberally. 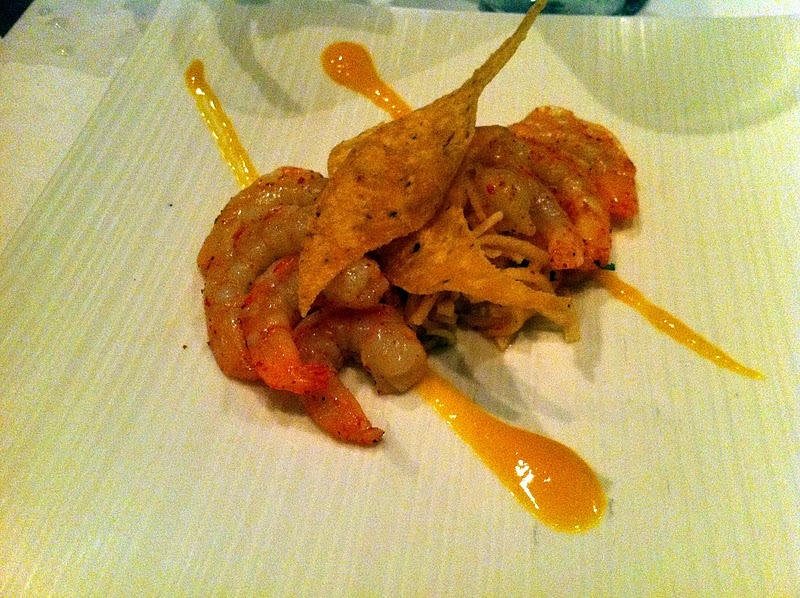 We wanted a sea-food starter to compliment the pork and tried the shrimp ceviche. It's definitely a different style of ceviche than what we expected. You basically get four small shrimp with tortillas and slaw (more yellow habanero sauce on the plate). Everything tasted fine but nothing stood out as particularly interesting. It did not remind me of a typical fresh and light ceviche dish. As for the main dishes we both liked our own selection best, but both were very good. Erica ordered the Asada (for $23, Grilled Flank Steak, Spinach, Asparagus, Roasted Red Peppers, Fingerling Potatoes and Goat Cheese Fondue) and I went with the Skate Wing (for $24, Pan Seared Skate Wing, Cauliflower, Yukon Gold Potatoes, Serrano Peppers, Grapes, Green Tomatillo and Caper Sauce). I only had a taste of the Asada but it was cooked well with plenty of flavor. The sides really added the plate with the goat cheese fondue a highlight for Erica. It was not surprising to hear every other table in restaurant order at least one Asada each. I'm in a Skate Wing mood this year and Mexique served a great one. I loved the combination of the tender and mild fish with flavorful, textured sides. 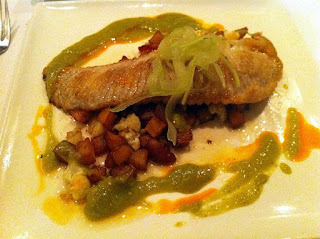 The diced potatoes and mini blackened cauliflower really hit the spot and provided substance with the delicate fish. As with the starers, I enjoyed using the green sauce to add nice heat to each bite. The mixture of mexican and french is artful and delicious. We really liked our meal even if the shrimp ceviche was not our favorite. 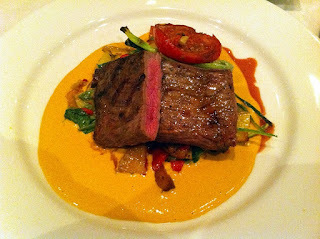 The flavors were interesting and demonstrated a high degree of skill and preparation. I was pleased the dominant cuisine was Mexican but showcased in a different style than usual. The presentations and technique were beautiful and clearly reminded the diner about the french fusion angle. The prices are neither rock bottom nor sky high. Main dishes in the $20s are justifiable in both size and taste. Our service was friendly, helpful and attentive. Mexique is a fun change of pace high quality meal. I like the fusion of great mexican flavors with beautiful french presentations and preparations.